3. In a blender, mix the milk, flour, salt, pepper and mustard. 4. Add the blended liquid to the saucepan, over low heat. 5. 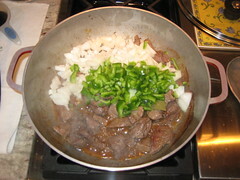 Stir constantly until sauce begins to thicken. 6. 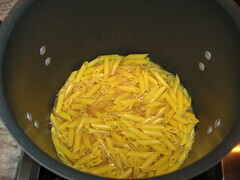 Add the grated cheese and continue to stir. 7. 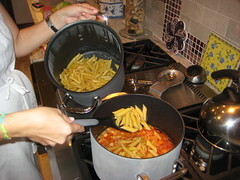 When the cheese has fully melted into the sauce, add the white wine, mix well and remove the saucepan from the heat. 8. 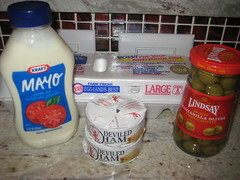 Spread the mayo on each bread half. 9. 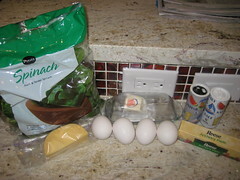 Slice hard boiled eggs and place slices of one egg on each bread half. 1o. 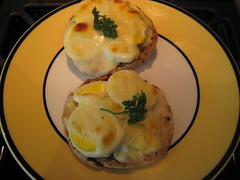 Cover each bread topped with egg with the cheese sauce, liberally. 11. Bake at 450 degrees for ten minutes, or until cheese sauce starts to bubble and turn golden brown. 12. Place a fresh sprig of parsley on top of each serving. 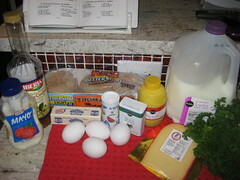 Some egg dishes are standards: revoltillo, tortilla, Florecitas de Huevos Rellenos (Deviled Eggs) and Huevos pasados por agua. Standards in my mind, at least. Eggs Florentine, if this is what I made, and Eggs in Cheese Sauce are not standard. And, while I’ll leave the anchovy paste of the Huevos a la Florentina (Eggs Florentine) behind, there is no chance you’ll catch me modifying Huevos en Salsa de Queso (Eggs in Cheese Sauce). Ever. 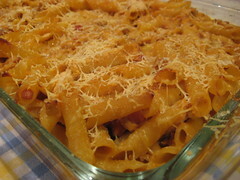 I decided to try this recipe on the day I found anchovy paste in the Publix in the Keys. I remembered there was a recipe that called for it and that’s how we got here. Reading through the prep, it wasn’t one I was excited to try. Preparing the dish is simple, really. Sauteeing spinach is fun. 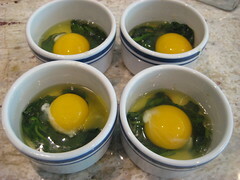 Putting the spinach in little ramekins and cracking an egg in the middle is funner. Taking the anchovy paste that comes in a toothpaste-like tube and circling it 'round the egg yolks, well, that’s just creepy. Grating gouda over the top, back to the good stuff. And baking them in the oven for about 10 minutes, until the egg sets, is just plain greatness. 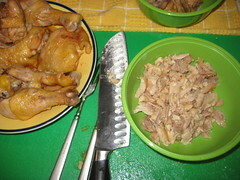 Anchovy paste should be used at the discretion of the comensal (the one doing the eating). I’ll just dab my egg yolks in the middle with a pea-sized anchovy drop next time. That will do the trick. Now, on the other extreme of the spectrum, we have the best egg dish known to mankind (read: known to me from the 7 of 27 egg recipes I’ve made so far). 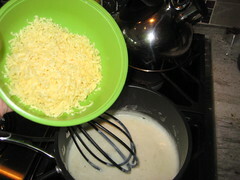 Any recipe that starts by having you make a cream sauce to add cheese automatically falls into the awesome category. To this day, I’m still not 100% sure that I know what an acemita is. I know it’s a bread, similar to an English muffin, or a flatbread, or unleavened bread. I haven’t found a package labeled, acemita, which is frustrating. So, if anyone has insight on this, please share. I’ve used either English muffins or Arnold’s Sandwich Thins, as they’re as close as I can get to what I think an acemita is. 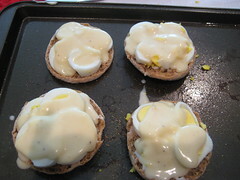 You build an egg sandwich on your toasted, mayo spread, bread and you drench it with your cheese sauce. Then you bake it for 10 minutes until the cheese gets bubbly and brown. You top it with perejil (parsley) for Cuban-ness and you take a bite. Of heaven. On a plate. Smothered with cheese. On an acemita wannabe. My favorite egg dish, indeed. 1. 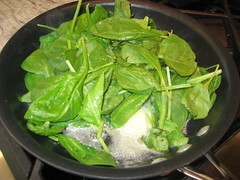 Sautee the spinach in the butter for a few minutes until fully wilted. 2. Season with the salt and pepper. 3. Divide the spinach into four servings and place in the ramekins. 4. 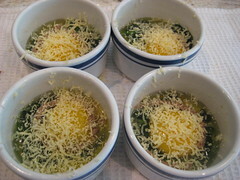 Crack an egg in the middle of each ramekin, over the sauteed spinach. 5. 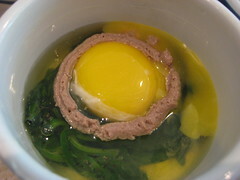 Squeeze out the anchovy paste, creating a ring around each egg yolk. 6. 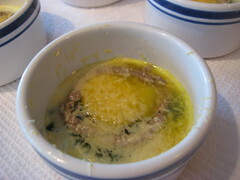 Top each ramekin with shredded gouda. 7. Bake at 325 degrees for ten minutes, until the egg is set. My day job has nothing to do with cooking. I work in marketing, PR, communications, etc. My day job has everything to do with marketing our company’s brands and working to create new ideas for our advertising clients. My colleague, our creative director, thinks that The Project is cool, so when faced with the opportunity to pitch a client with a multimedia campaign that included TV commercials for tailgating tips, he thought it would be a great idea to use me as his "chef". So after plenty of weeks of avoiding eye contact and direct questions, I finally gave in and agreed to do this. 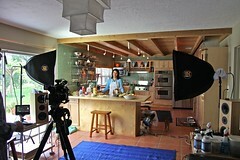 And, in the true way that I do things, I prepped until four in the morning, right before my "chef" television debut. Good thing that our creative director’s better half is a makeup artist. I was going to need the help. 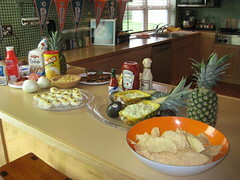 I was asked to come up with a menu that would be great for tailgating. So, I went with Guacamole (oh, so, not what you think), Deviled Eggs (pretty impressive) and Fritas (which I had made last year, but they’re just so good I had to include them). Easy enough. First of all, this recipe is odd. It’s one of the worst I’ve made and it’s not that it’s gross, it’s just odd. You take a pineapple and slice it in half, lengthwise, which I actually had to pull up on YouTube because I had no idea how to really cut a pineapple and gut it. 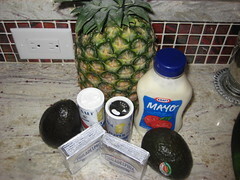 You take the pineapple guts you took out, cut them up, mix it with avocado, cream cheese, mayo, salt and pepper. 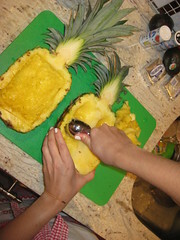 Then, you put the pineapple guac back in the pineapple you gutted out. 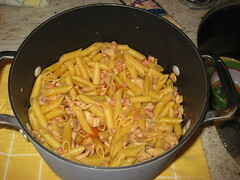 The recipe is easy, the result is kind of icky. 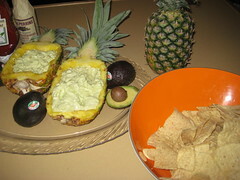 And, since I was prepping the night before, I was majorly stressing about how to keep the guac from turning brown. I put the avocado pit in the guac and kept the guac in a plastic container. I wrapped each pineapple with plastic wrap and hoped that wouldn’t turn brown. They fared well, so indeed the tricks worked. This, too, was an easy recipe. I had pre-boiled the eggs a day earlier so that didn’t take up time during marathon prep night. 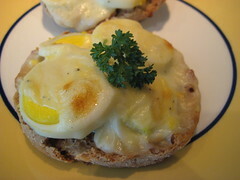 The yolks are mashed up with deviled ham and mayo, then topped with olives, which gives these deviled eggs such a nice flavor. I had never made deviled eggs before and I will tell you that this recipe is definitely one to make again. I don’t have a pastry bag so I used a plastic bag and cut one of the ends off. It piped into the eggs easily. 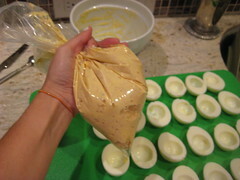 My friend, Alex F., has a good tip that I’ll use next time: mash the yolks and all the ingredients inside the plastic bag so you have less cleanup to do. I had mashed everything in a bowl and then transferred it into the bag, which works also, but the less cleanup, the better. 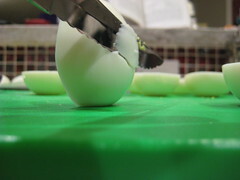 Another trick is to take a sliver off the back of your egg white in order to keep it steady for filling and displaying. No wobbly serving platter. And then, the Fritas. I had made Fritas back when I first started The Project and since it was a recipe I had already gone through, I decided to play around with it and add some chorizo. Adding chorizo was a great idea, but I have to find a way to grind it up finer. I put the chorizo through the food processor which gave me little chorizo disks that I blended into the meats. 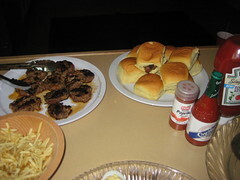 The taste was great, and the visual for the commercial was awesome – all the grease rendering in the skillet was pretty. So, as football season comes upon us (since I’m so backlogged in my blogging), this post’s timing couldn’t be better. Hope you have fun making these recipes. But please, prep smarter. Don’t stay up until four in the morning before a football game. There won’t be a makeup artist around and you’ll probably be asleep by kickoff. And that, isn’t the way to enjoy a football game. Besides, if you’re asleep, no one will tell you how good your food is. And that’s no return on your 4 a.m. investment. 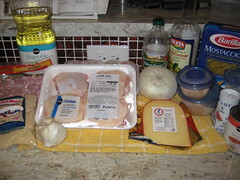 From the moment I started this project, my husband had two requests: Carne con Papas and Fricase de Pollo. I’m not only proud because I have only one more to create for him, but because this first one, literally Meat and Potatoes, was as perfect as the classic he was hoping for. I did a grocery run during lunch to gather the ingredients. It was a Tuesday and I was determined to have us eating before 8 p.m. I wish, of course, that we’d be eating during the week at a decent 6:30 p.m., but, alas, I’ve come to the conclusion that it’s going to take some more discipline on my part to leave the office right at 5 p.m. in order to have us eating earlier. It’s a big struggle. 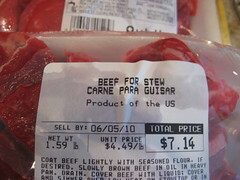 I tend to get confused with what type of meat to use for what so when I asked the butcher lady what meat I’d need to use for Carne con Papas, she quickly escorted me to pre-cut beef chunks labeled, Beef for Stew / Carne Para Guisar. Easy enough. 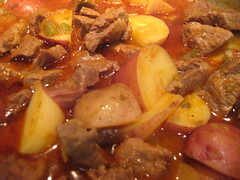 Carne con Papas is on. This recipe is so simple. It’s straightforward and best when served alongside killer (white) rice. I didn’t even have to cut up the meat because I found it in perfect squares in the grocery store. I threw the meat in with hot oil and when the meat was golden and had released its grease, I added salt, pepper, paprika, a bay leaf and the Cuban trilogy. 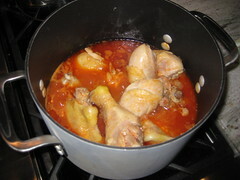 When all that is nice and sofrito-ed, add in a can of tomato sauce, white wine (using the tomato sauce can to measure) and water (using the tomato sauce can again). 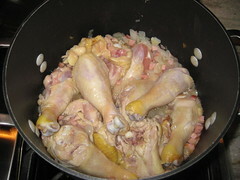 Leave on medium heat until boiling and then add in the potatoes and capers. I left it on low for 30 minutes so I could make the killer rice and sit down for a few minutes. This is a good make-ahead meal and a good weeknight meal, if you’ve got everything chopped up and ready. It could take you about 45 minutes to whip this up, which gives you time to start on some homework or have your hubby bathe the kids. 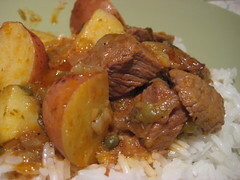 A word of caution – your house will smell very Cuban when you make this recipe. It hits every scent from my childhood and I’m sure it will do the same for your home. Maybe I should pitch my cousin at Soy Delicious candles this scent idea – Carne con Papas candle, anyone? Sofrito smell, anytime. Any takers?